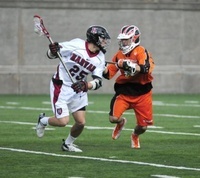 Jason DuBoe was drafted by the Boston Cannons of Major League Lacrosse on June 6. When Yale ended the Harvard men’s lacrosse team’s season, graduating Crimson midfielder Jason Duboe thought he might be hanging up his stick for good. But it turned out that the two-time NEILA All New England first-team selection wasn’t finished playing lacrosse. On June 6, the Boston Cannons selected Duboe with the 33rd overall pick in the Major League Lacrosse draft. Duboe joins a talented Cannons squad that includes Paul Rabil. The 2008 Johns Hopkins graduate was named the MLL MVP and Offensive Player of the Year in his rookie season after winning two National Championships and earning three All-America honors at Hopkins. Also new to the Boston squad is a former college rival, Max Quinzani, who capped his college career at Duke with a national championship. In 2009, Harvard upset the then No. 5 Blue Devils before falling to them 14-5 this year during Duke’s national championship run. But according to Duboe, the recent history between the schools hasn’t led to any bitterness between him and his new Cannons teammate. But while the new pro adjusts to new teammates, new coaches, and a new level of play, he won’t have to adjust to a new field because the Cannons play at Harvard Stadium. Home field is just about the only thing staying the same for the former Crimson midfielder, but for Duboe a few adjustments is a small price to pay to keep playing lacrosse. “I’m just out there to help the team in any way I can,” Duboe said. “I already sense that there’s a great deal of camaraderie."